Samantha Josephson was beloved in Columbia, S.C., and Robbinsville. As has been reported, 14 hours later Josephson’s body was found near New Zion in Clarendon County, 70 miles away. The Chevy’s driver, 24-year-old Nathaniel David Rowland, was charged with kidnapping and murdering Josephson, who died of multiple stab wounds. At her funeral on April 3 at Congregation Beth Chaim in West Windsor where she celebrated her bat mitzvah with now-Rabbi Emeritus Eric Wisnia, Seth Josephson, her cousin, read a statement hoping for changes in the ride-share industry. “The family’s message that it hopes people — young adults for certain — take from this senseless killing … is that the ride-share community, Uber and Lyft, learn from this and take ownership of the fortune made by their customers,” he read. The New York Times reported Thursday that Josephson was one of several victims of ride-share impersonations, though the other incidents have primarily resulted in robbery and sexual assault rather than murder. Vigils were held for Josephson’s friends and family in Columbia on Sunday, March 31, and Robbinsville on April 2. Although she was not active in the Columbia Jewish Community, within hours of the body being found on March 30 university officials contacted Cheryl Nail, the Columbia Jewish Federation’s public relations and communications director, to inform her Samantha was Jewish. The community quickly came together. According to a Columbia Federation statement, Nail took immediate action to help fellow students and the family. Nail first connected USC with Hillel’s Rabbi Leah Doberne-Schor, who made herself available to students. When Shabbat ended, Nail reached out to Rabbi Sruly Epstein from Chabad at USC and gave him the news, then notified parents that students could contact Epstein if they needed to talk about the loss. The following day, Epstein and Rabbi Meir Muller, of Columbia’s Cutler Jewish Day School, helped students plan a vigil for that evening. It drew an estimated 500 people, and Samantha’s family, who had flown in from New Jersey, and friends shared memories. Both Epstein and Muller offered prayers. 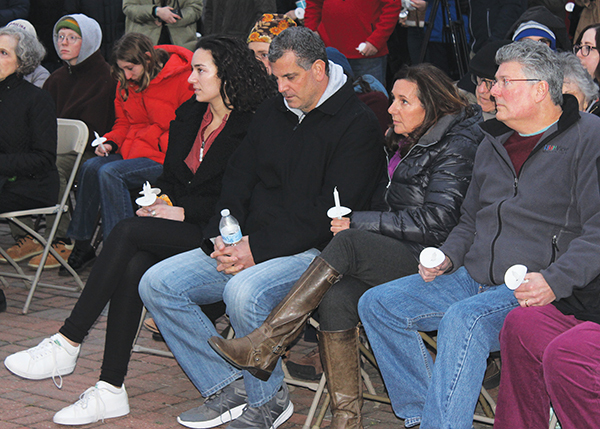 An estimated 250 came to the Robbinsville memorial for Samantha at the town’s lakeside gazebo two days later.